The website for the game calls the game “casual strategy”, which is pretty dang accurate. 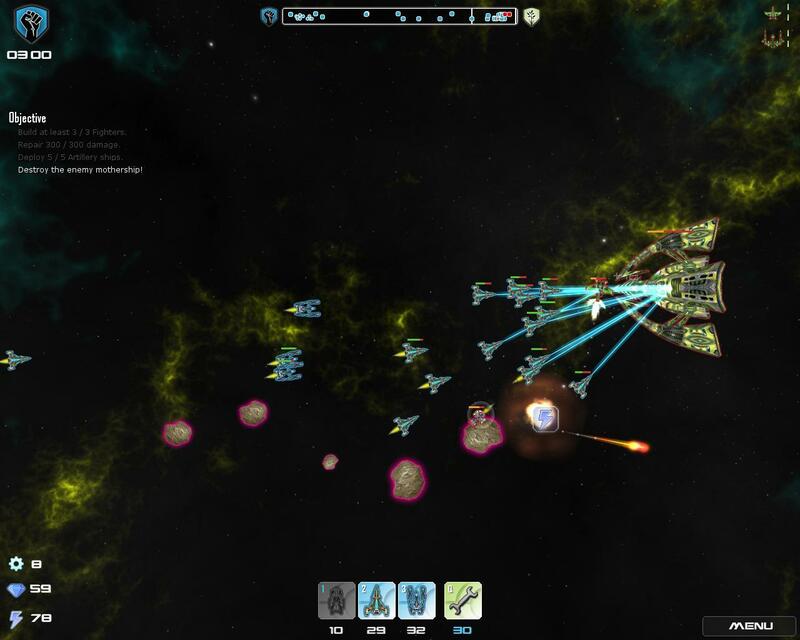 This game has elements of strategy (resource gathering, research) and tug of war (two forces vying for control), with a little Gratuitous Space Battles thrown in (lack of direct control over ships). While it’s termed “casual”, that doesn’t mean it’s lacking in either depth or gameplay, however. The crux of the gameplay is this. 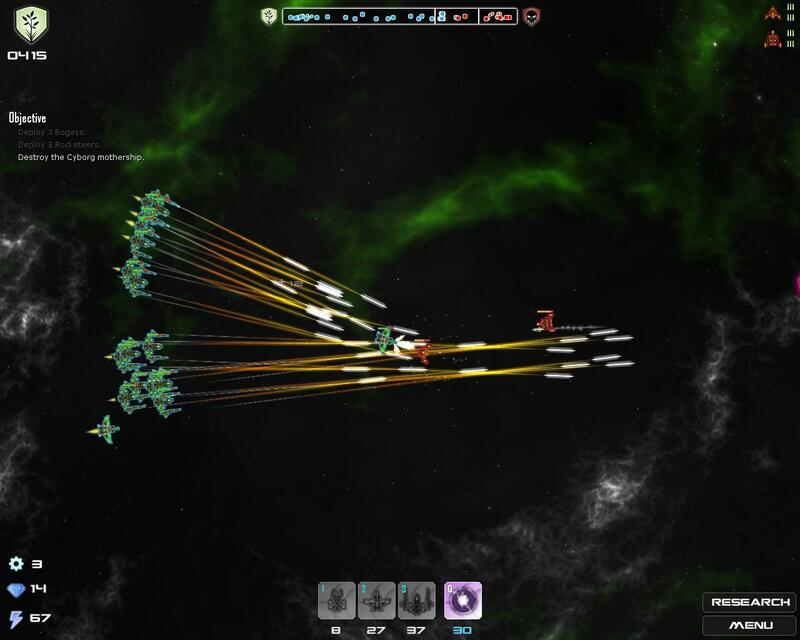 You control the force on the left side of the screen, while your enemy controls the force on the right. You have a mothership that builds other, small ships, and once built, they go off and do their own thing, which is either mine for minerals or fly off toward the enemy force. Different ships do different things, and each of the three sides included in the game has a lovely variety to them that just aren’t the same ships with different skins. 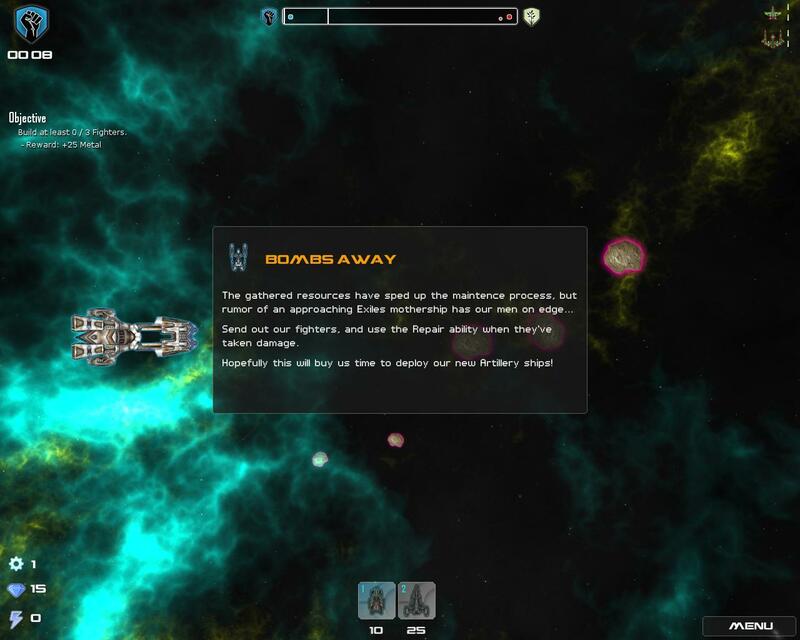 The ships aren’t under your direct control, but the AI is smart enough to have ships follow their basic orders, like shield this ship or tow that one. The game has quite a lot of gameplay shoved into it. 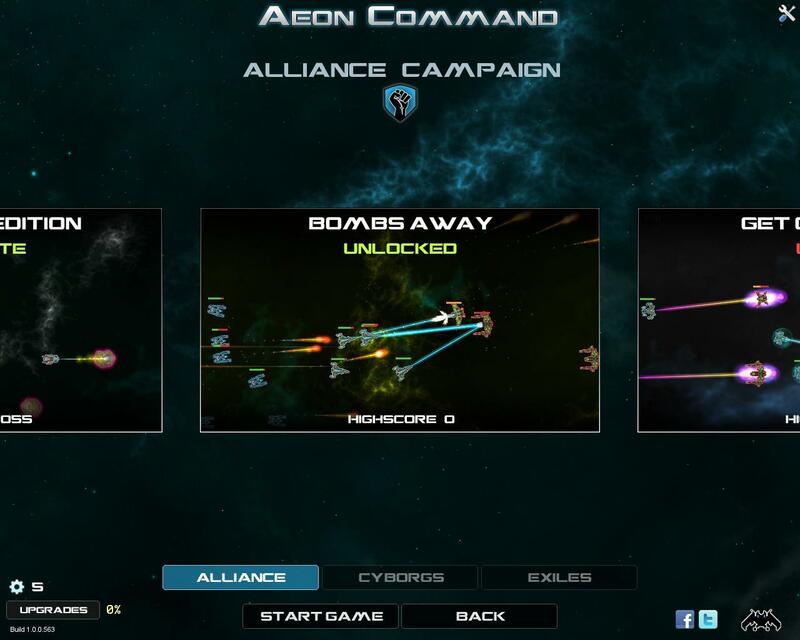 Three campaigns for each race with several missions each, a skirmish mode. The campaigns are played in a specific order, and completing them are needed to unlock the next one. Each mission in the campaign has varied objectives. I mean, the ultimate objective most of the time is to destroy the enemy mothership, but stuff is also thrown in your way to prevent that, such as “destroy these suicide ships” (yup, one side has kamikaze units) or “protect this ship as long as you can”. It adds a nice bit of variety to the game, and the missions in the campaign were quite fun to play. 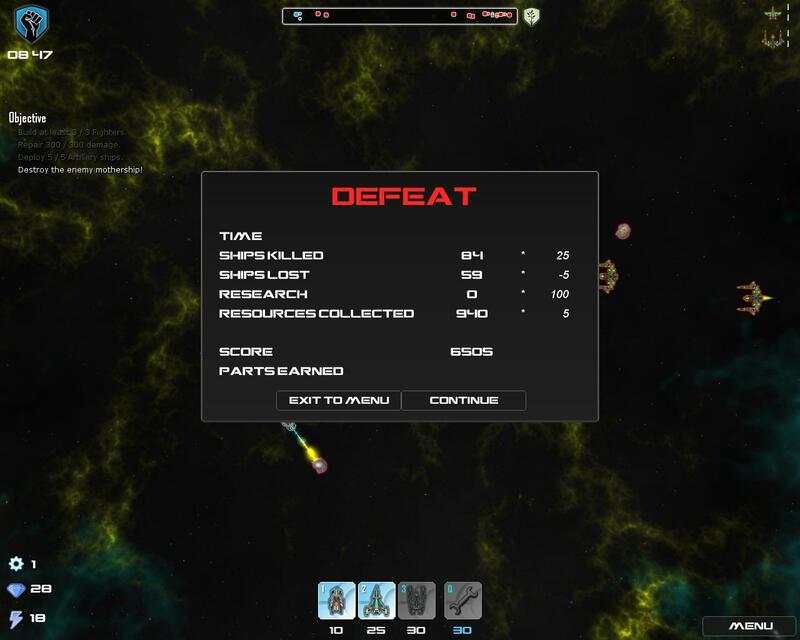 There were a few times wherein I lost a campaign mission, but was easily able to glean the mistakes I’d made (such as “oh, you need more mining ships” or “oh, you need more shield ships”) in order to survive the next attempt, so it felt like the game was kind of helping me along to win, which kept frustration low while challenge moderate, a nice balance. The campaigns are also necessary so as to learn all the nuances of each ship, so that you’ll be better at skirmish and multiplayer modes. This also is a great way to get gears during missions, which you use to upgrade your ships with stronger weapons, armor, and so on. This all gives the game a great “one more match” feel. 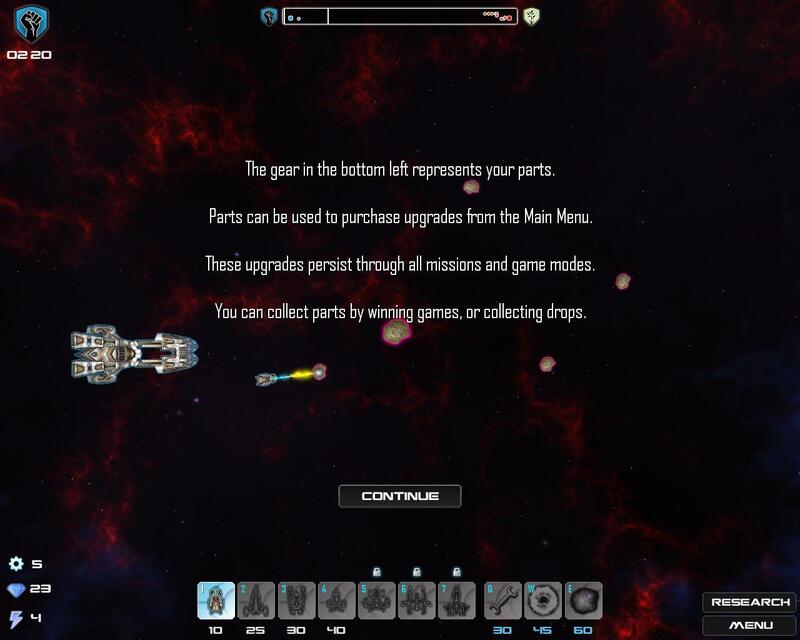 Besides building ships, however, you also have various powerups available that come at the cost of energy (which you get through destroying other ships). These powerups can be offensive such as the wall of flame you see above, or defensive such as repairing ships in a certain area. 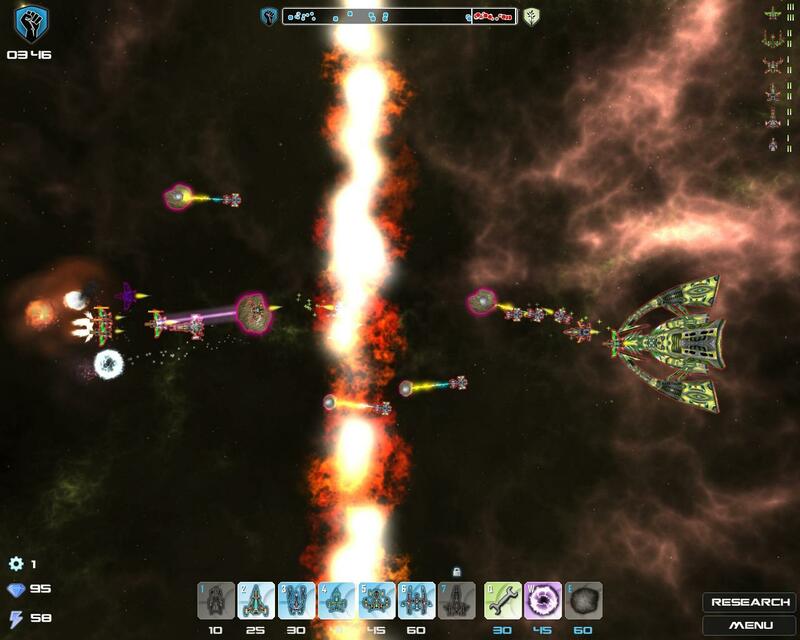 Like the different ships, each side has its own unique powerups adding to the variety. When all of your ships and powerups come together in order to finally destroy an enemy mothership, it’s a very satisfying feeling. If there was one thing that bugged me about this game (and there truly was only one, really), it’s that some of the ship designs are a bit too similar to me, which caused a touch of confusion. In the three sides in the game (Alliance, Cyborg, Exiles), the Cyborg and the Exiles had ships that looked just too similar, which threw me a bit. Not a big deal, obviously, but something I wanted to mention regardless. 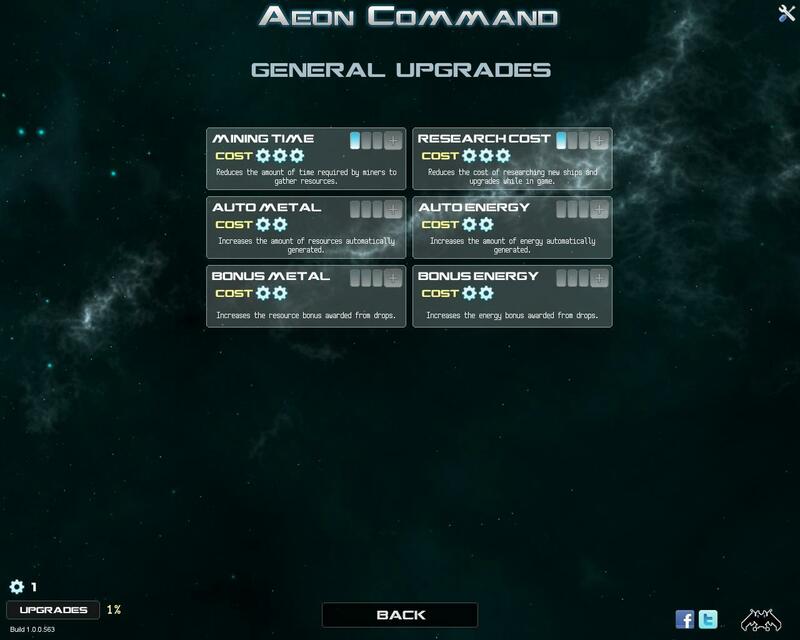 Overall though, Aeon Command is a decidedly fun time that can take as little or as much time as you’d like. It’s easy to play, quick to jump into and loads of fun. I had a great time going through all of the campaign missions and playing some skirmish maps (I didn’t get to play multiplayer), and I could easily recommend this to any space game battle fan, as it really scratches that itch pretty damned well. For $8 on the PC and $3 on iOS, you get a lot of gameplay that’s definitely casual and definitely fun. I suggest y’all try out the demo and see for yourself how much fun the game is. :) Enjoy! Finally, below, please check out the gallery of all of the screenshots I took for the game, and thanks for reading. Have a great day! Welcome to the blog, Bob, and thank you for the kind words. As for an Android version, I think they just completed the iOS version, so who knows? Brian – I think I found you through some KS projects that linked to your page (maybe Skyjacker? ), and thought “Space Game Junkie? that sounds like the content would be right up my alley!” Of course, I had no idea how many other games I’d missed! Just going through a few of your more-recent blog posts I had a huge list of games to catch-up on! Again – I’ve missed so many! Yeah, I keep saying that when I started this site, I thought most of my time would be spent covering classic games with the occasional new game. NO IDEA there was so much out there. It’s so awesome. :) I’m glad I can help keep you updated. Next story Vote for Ring Runner in The Next Game Boss! !